Made to showcase the then-new 7.0-liter Hemi V8, the 1964 Dodge Hemi Charger concept car is one of the most coveted pieces from Dodge's history. It packs one of the 15 original race Hemis built, mated to a three-speed automatic. The fully restored, extreme bodywork puts it on the map, but the reported output of over 600 horsepower (kept in check by hydraulic drum brakes) promises to rip it right up. The last time this vehicle changed hands in 2007 it went for a reported $1.1 million. Now it's destined for the gavel once again as RM Auctions takes it to the Arizona Biltmore on January 20. Thanks for the tip, Arthur! 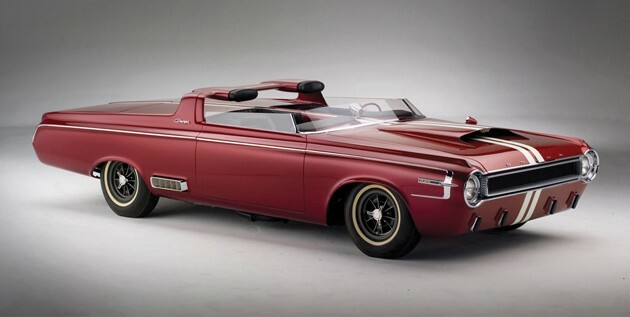 [source: RM Auctions via Top Things Stuff]Leading the Charger: '64 Dodge Hemi concept up for auction originally appeared on Autoblog on Wed, 12 Jan 2011 09:57:00 EST. Please see our terms for use of feeds.